Ultimate Pools of Arlington, TX is a complete residential and commercial pool & spa service company, serving the DFW Metroplex for over 20 years. We repair and remodel all types of swimming pools and home spas. All of our repair technicians have been trained to provide you with the best service possible and have knowledge to troubleshoot any situation that may arise with your pool system. Licensed and insured, our repair technicians are trained to quickly diagnose and repair pool equipment on site. Many of our associates are Certified Pool Operator (CPO®) designated and receive extensive ongoing training, to ensure you the best and most up-to-date repair service available. From pool inspection to complete pool system design, we do it all. We carry most repair equipment on our trucks, so we are able to repair your pool equipment right away. 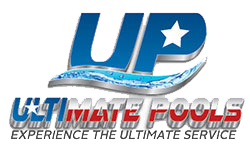 Ultimate Pools also repairs pumps, motors, filters, heaters, PVC leaks, control systems, salt system and more. If you need a repair of any sort, give us a call right away! Serving our community since 1992, we have been repairing our neighbor’s pools and keeping them up to date with the latest technologies and State requirements. The new technologies allow for significant energy savings as well as complete automation. Plus we are here to help you become familiar with the new variable speed pumps, which can save you up to 90%, on your pool operating costs. These items and more will need to be inspected carefully by our pool inspection pros. If you are purchasing a home with a pool in the winter time, we can still perform inspections by getting the pool up and running to do so. This is very important. You do not want to have any hidden surprises when you go to open your pool in the summertime. As well as saving money, homeowners also want to stay safe and up to code with local rules and regulations. Our pool inspection technicians stay up to date on all state codes such as pool enclosures and fencing, recommendations and estimated repair costs. Many of our associates have their Certified Pool Operator (CPO®) designation, making us a rarity in the industry (most pool service companies have zero or one CPO® designated employee) and is emblematic of our strong commitment to excellence.